If we go by their numbers, Parsis do not amount to more than a minuscule minority in the country. Their total population in India was around 61,000 according to the 2011 census. Unfortunately, the population of Parsis has been steadily decreasing and demographers say that by 2030, they may even cease to be a minority and may become a vanishing tribe. There are several reasons behind it — the chief one being that Parsis are an insular community when it comes to matrimony. They marry within their own community and are quite strict about it. If anyone breaks this rule and marries outside the community, he or she may cease to be called a Parsi. But barriers of caste and creed are now breaking down and the young generation of Parsis today do not always go by the strait-jacketed rules of their community. So, inter-religious marriages between Parsis and other communities now take place more often than ever before. Parsis, unlike other communities of India, are not as procreative. “Be responsible — don’t use a condom tonight,” was a light-hearted advertisement inserted by the Central government in newspapers to encourage Parsis to be more procreative. Aruna Irani with Amitabh Bachchan in Bombay to Goa. Being Zoroastrians who faced Islamic persecution when Islam reached Persia, a large number of Parsis emigrated from Persia to India more than a thousand years ago and settled mostly in Sindh, Gujarat, and Maharashtra. But in matters matrimonial, the community was orthodox right from the start which has not changed much even today. In fact Parsis are afraid of losing their identity by inter-marrying with people belonging to other religions in India. So, marrying within the Parsi community is the rule and marrying outside is an exception. However, the importance of the Indian Parsi community lies more in what it has achieved in various walks of life than in its insignificant numerical strength. Affluent, enterprising, and highly intelligent, Parsis have done remarkably well in the field of science and industry. Homi J Bhabha, Homi N Sethna, JRD Tata, and Jamshedji Tata are distinguished Parsi names. Godrej, Cowasjee, and Wadia are other well-known Parsi families in India owning massive business empires. The Parsi contribution to Hindi cinema is also of considerable value. Hindi cinema in its initial years was greatly influenced by Parsi theatre, beginning from India’s first silent movie Raja Harishchandra (1913), which was a filmed version of a stage play of the same name, to the tales of Shirin Farhad, Leila Majnu and other such legendary lovers, the influence of Parsi theatre was clearly visible in the acting style. In fact, some actors of Parsi theatre switched to films when sound recording techniques enabled filmmakers to produce talkies (speaking films). It was Ardeshir Irani, a Parsi, who created a sensation in 1931 by making India’s first talkie titled Alam Aara. The original film has been lost now, but Ardeshir Irani’s name shall remain immortal in the history of Indian cinema. One of the earliest actors to come from Parsi theatre to the film industry was Sohrab Modi who not only acted in films but also produced and directed them. His first film Khoon Ka Khoon (1935) was based on Shakespeare’s Hamlet. In this film, for the role of Ophelia, Sohrab Modi introduced Naseem Banu, mother of actress Saira Banu. His next film was Said-e-Havas (1936), also based on Shakespeare’s play King John. In 1936, Sohrab Modi built his own studio called Minerva Movietone. He produced, directed, and acted in many memorable films based on fictionalised history. His notable films were Pukar (1939), Sikandar (1941), Prithvi Vallab (1943), Sheesh Mahal (1950), Jhansi Ki Rani (1953), Mirza Ghalib (1954), Kundan (1955), and Raj Hathh (1956). In the 1930s, a Parsi named JBH Wadia, a post graduate in English literature with a degree in Law, entered the film industry. JBH Wadia had initially started his life as a lawyer, but he was soon won over by the world of movies and he worked hard to learn the craft of filmmaking. He also had a flair for scripting film stories and he was joined by his younger brother Homi Wadia who together, set up their film production unit called Wadia Movietone on 13 April 1933. Since talkies had now caught the fancy of movie-goers, Wadia brothers mastered the technique and started making action movies which in those days were known as “stunt films”. At this time the Wadia brothers came across a tall and well-built Australian girl named Mary Evans, a trained circus artist who could perform breathtaking stunts. The brothers saw in her the future heroine of their stunt films and they gave her a new identity, renaming her Nadia — the fearless Nadia. Nadia was cast as the dare-devil heroine in a number of Wadia Movietone films. Her outlandish looks, skimpy dresses, and speech in an anglicised version of Hindi fascinated the cine-goers. Her outstanding films were Hunterwali, Diamond Queen, Miss Frontier Mail, and many others. Boman Irani in 3 Idiots. The hero of most of her films was an Englishman named John Cawas who had learnt to speak Hindi and had thus made India his home. These movies made Wadia brothers the most successful filmmakers of their time. 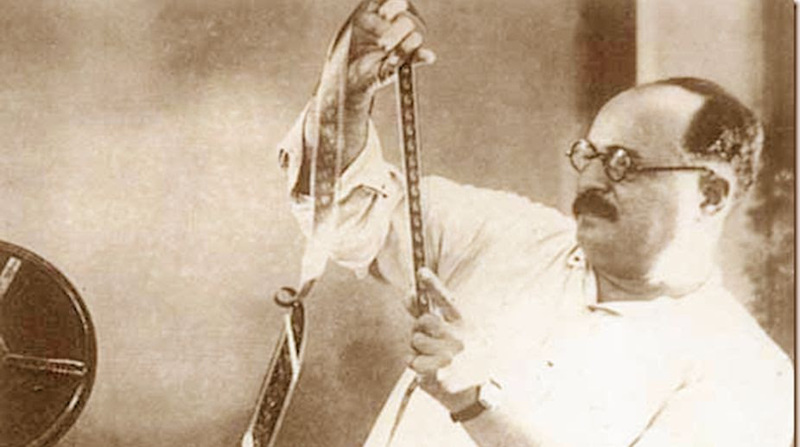 Aspi Irani, a filmmaker of Parsi origin produced and directed many films in the 1950s and 60s. Among his well-known films, Oomar Qaid, Shirin Farhad, Smuggler, and Garam Masala deserve a mention. Faredoon A Irani was a star cinematographer of the film industry in the 1940s and 1950s reputed for his excellent lens skills. To him goes the credit of cinematographing a large number of films produced and directed by Mehboob Khan. A few famous Mehboob Khan films for which Faredoon A Irani wielded the camera are Anmol Ghadi, Andaz, Aan, Amar and Mother India. Two Parsi sisters joined the film industry as child artists in the 1950s. The elder sister Daisy Irani was the first Parsi child star whose performance in films simply bowled over viewers. She was seen in numerous films of the 1950s as a child star, among which Ek Hi Rasta (1956) and Naya Daur (1957) are well known. Soon she was followed by her younger sister Honey Irani who too took to films as naturally as a duck takes to water. Among Parsi actresses who have earned name and fame, Aruna Irani has had quite a distinguished career in Bollywood. She started her acting career as a child star with the Dilip Kumar-Vyjayanthimala starrer Ganga Jamuna (1961). In due course Aruna Irani graduated to adult roles in films. In Bombay to Goa (1972), she was cast as the heroine opposite Amitabh Bachchan. As a versatile actress, having attempted both positive and negative roles with equal ease, Aruna Irani has acted in hundreds of films and TV serials. Among the present day film stars of Parsi origin, Boman Irani is well known for his versatility, gaining fame with Munna Bhai MBBS and later, 3 Idiots. In the role of a principal of a medical college being riled by a roughneck student from the streets of Mumbai, Boman Irani gave an outstanding performance in Munna Bhai and has since acted in numerous films and won accolades for his acting. Choreographer Farah Khan and her brother Sajid Khan are also partly Parsi- their mother was a Parsi and their father a Muslim. Similarly, actor-director Farhan Akhtar is the son of Honey Irani and lyricist Javed Akhtar. John Abraham is also of mixed parentage with his mother being a Parsi. Homi Adajania, a Bollywood director known for films like Being Cyrus, Cocktail and Finding Fanny is also of Parsi heritage. Mehr Jasia former Miss India, Nauheed Cyrusi, a model and Bollywood actress, and Shaimak Davar, a noted choreographer are other noteworthy community members. All in all, Parsis are creative people who have left their mark in all walks of life, including cinema. You are welcome to share the article and the pictures – I am sure our readers would love them!